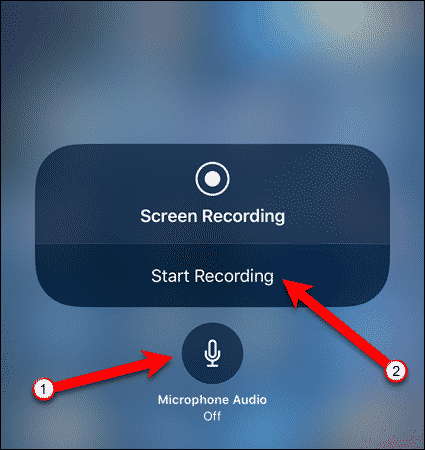 If you want to explain how something works on your iPhone or iPad, you can record the screen, showing the steps in action. 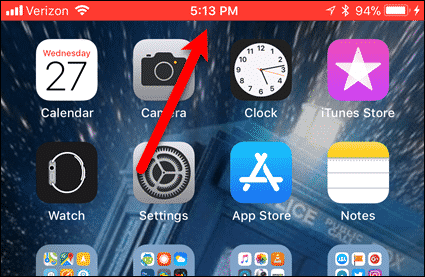 Previously, to record the screen on your iOS device, you needed to connect your device to your Mac and use QuickTime, or another costly app. 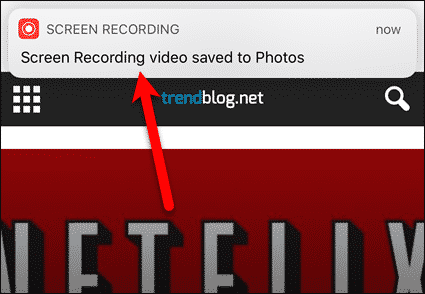 However, if you don’t have a Mac handy, you can still record the screen on your iOS device. 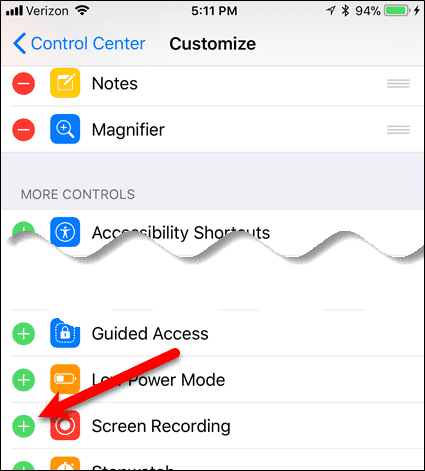 Apple has finally added a Screen Recording feature to iOS 11, which allows you to record the screen without connecting the device to your Mac. 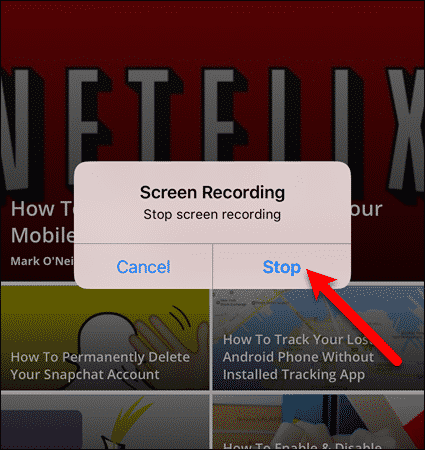 Today we’ll show you how to use the new Screen Recording feature and how to trim the video right on your device. 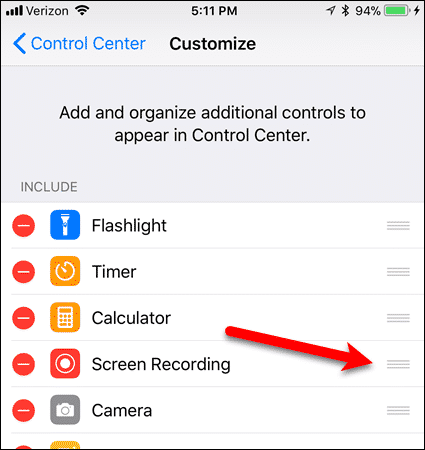 The Screen Recording feature is integrated into the newly customizable Control Center, but it’s not enabled by default. 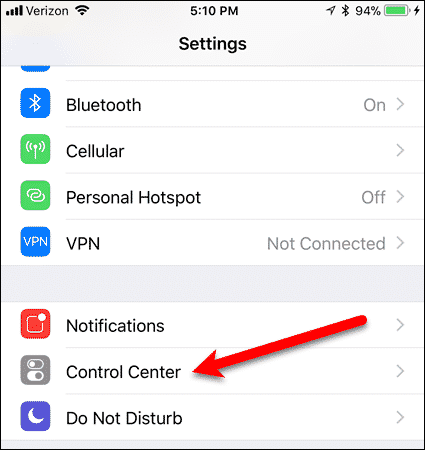 To enable this feature, open the “Settings” app and tap “Control Center“. On the “Control Center” screen, tap “Customize Controls“. 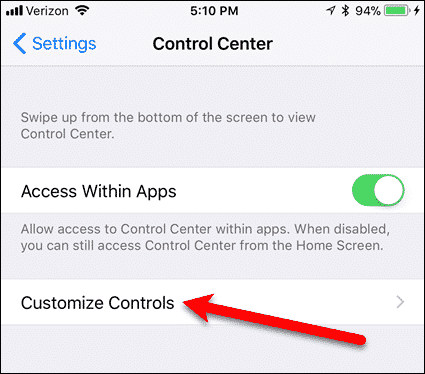 Scroll through the “More Controls” section and find the “Screen Recording” control. Tap the green plus button next to it to add the control to the Control Center. The control is added to the bottom of the “Include” section. You can rearrange the controls in the Control Center. To move a control in the “Include” section, hold your finger down on the three horizontal bars to the right of the control you want to move and drag it to another location in the “Include” section. Now you’re ready to record the screen. 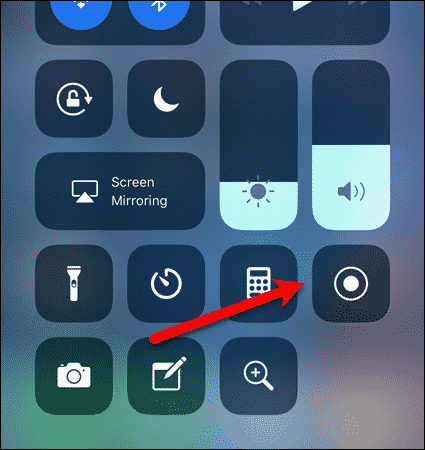 To record the screen, swipe up from the bottom of the screen to open the Control Center. The Screen Recording control looks like a standard recording button. You can tap on it to begin recording. It will count down from three and then turn white with a red blinking recording button indicating recording has started. You can also use 3D Touch on the button (if you have an iPhone 6 or above) or long-press on the button to access the audio option. 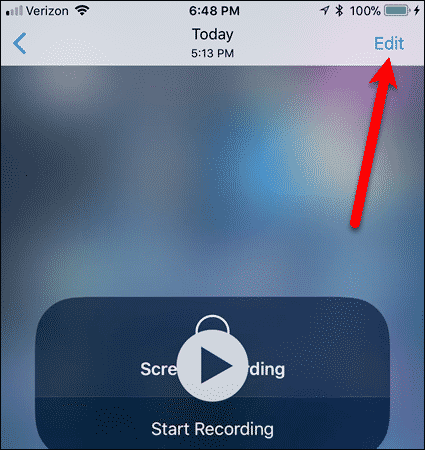 If you want to narrate your video, tap the “Microphone Audio” button. Swipe down from the top of the Control Center to close it and start performing the actions you want to record. When you’re ready stop recording, tap the status bar at the top of the screen, which has turned red. Tap “Stop” on the dialog box that displays. A notification displays saying that the Screen Recording video was saved to Photos. 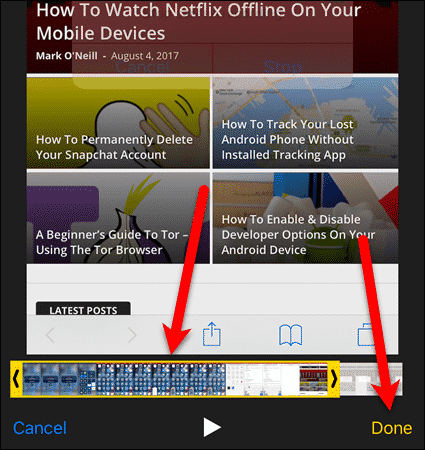 Tap the notification to access the video in the Photos app, where you can share the video using the “Share” button or edit the video. We’ll show you how to trim the video in the next section. It’s very handy to be able to record the screen directly on your iOS device, but the feature isn’t perfect. 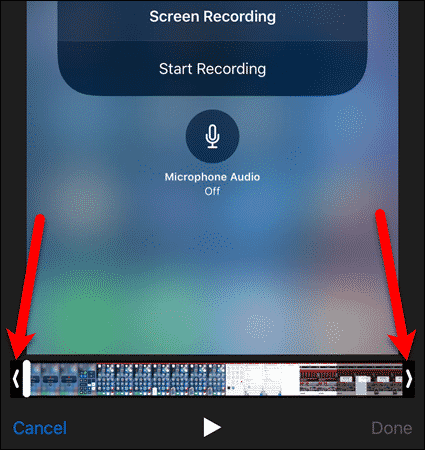 When the video is saved, it includes the part where you swiped away the Control Center and where the dialog box popped up to stop the recording. However, if you’re going to share the video or send it to someone, you’ll want to trim away the unneeded parts at the beginning and the end of the video. Access the video in the Photos app and tap “Edit“. In the editing view, you’ll see the entire video in frames between two arrows at the bottom of the screen. To trim the beginning of the video, drag the arrow on the left end of the video to the right until you see the point in the video where you want it to start. Then, drag the arrow on the right end to the left until you see where you want the video to end. A yellow border appears around the part of the video you want to keep. You can keep adjusting the arrows until you get the video trimmed just right. At that point, tap “Done“. 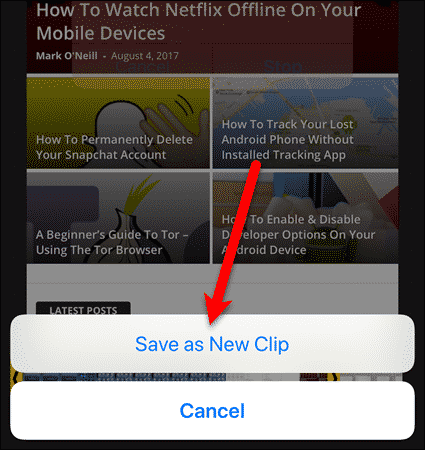 Tap “Save as New Clip“. The original video is preserved and the trimmed video is saved as a new video. What do you think of the new Screen Recording feature? Is it better or worse than recording using QuickTime on your Mac, and in what ways? Share your thoughts in the comments below.